"Namaka" means water Goddess in Hawaiian. Mermaids are matrons of enchantment, entreating sailors with beguiling beauty, grace and mesmerizing melodies. Seductive and charming, all those in contact with mermaids are subject to their persuasion. When I first decided to leave my hustle and bustle city life behind and move to Hawaii's tropical paradise of Oahu about a year ago, I was mesmerized by all of the beautiful blues and greens that I could see everywhere I went. 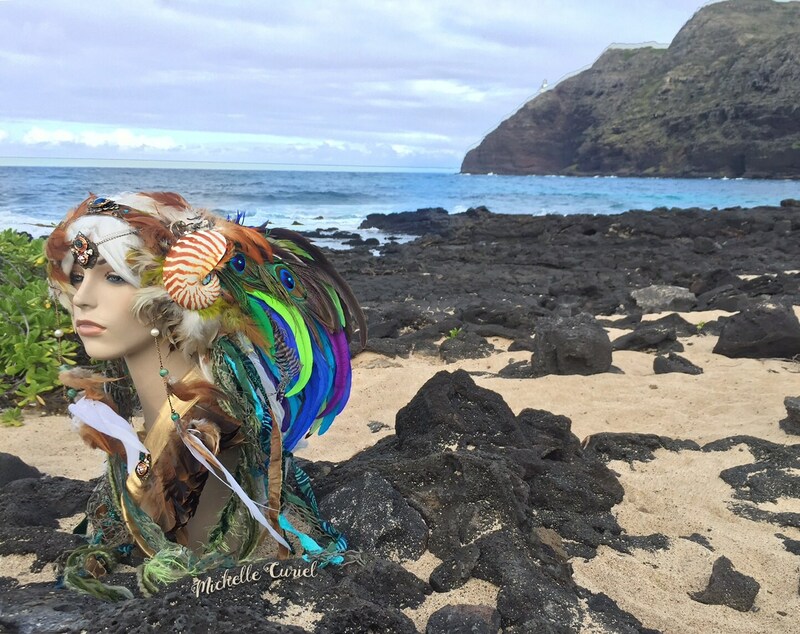 Needless to say I became inspired to create a headdress that embodied the colors of this magical land of Aloha. 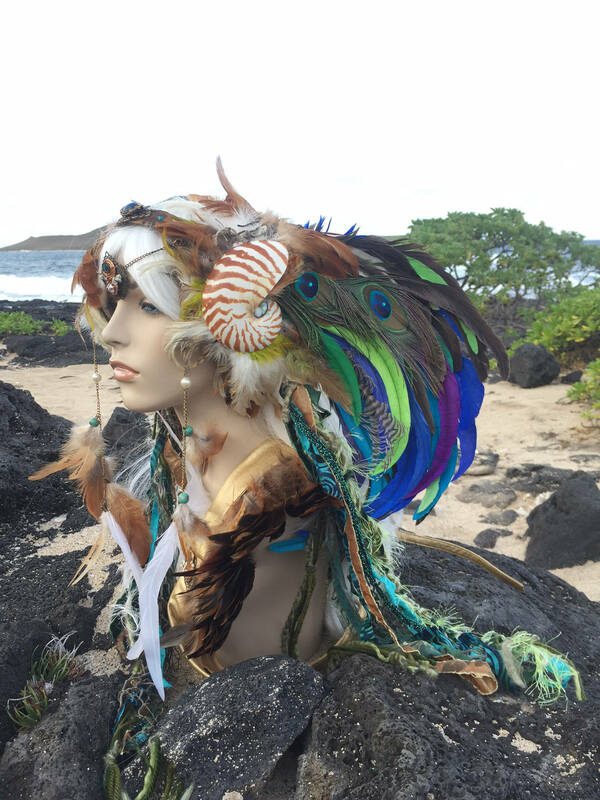 The headdress in these photos is one of the headdresses that I have made that have been inspired from the islands. 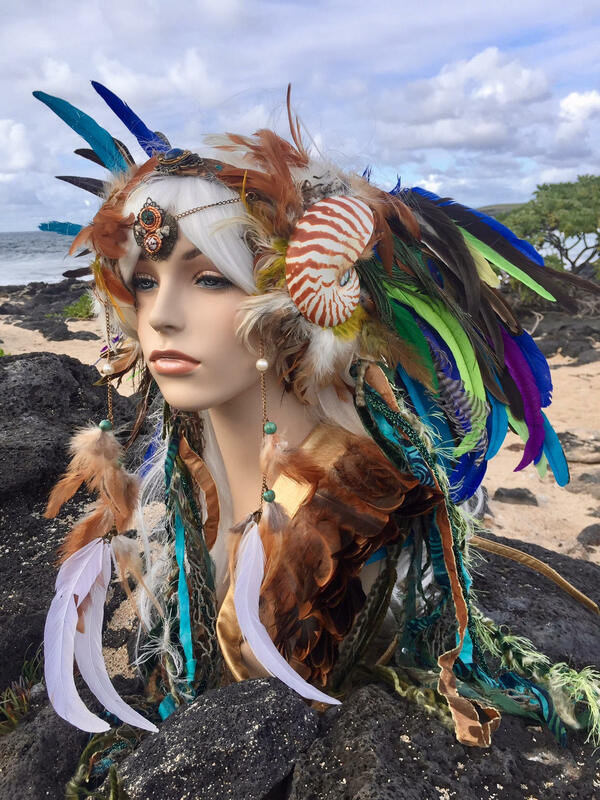 This beautiful piece of wearable art comes with 2 gorgeous 5 inch Nautilus shells purchased at a local shell stand on Oahu's North Shore and placed on each side of the headdress with beautiful rooster, peacock and pheasant feathers representing colors of Hawaii's beautiful aqua ocean and lush rainforests: green, brown, turquoise, blue and peacock feathers. It sits on a wire headband and has ties in the back. 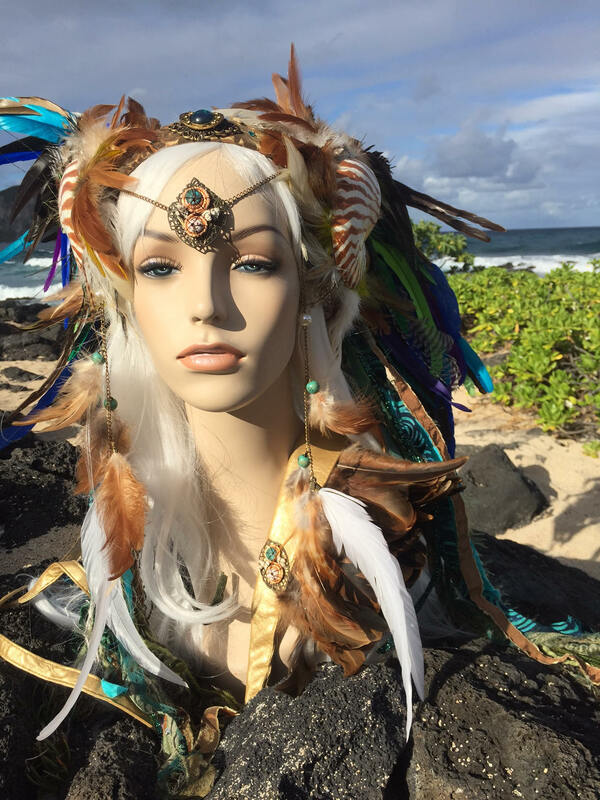 There are pieces of fishnet and brilliant fabrics that hang from the side and can be used to tie the headdress in the back so it can fit more securely. Rhinestones are scattered about this beautiful piece of wearable art. I also place tiny shells and sea glass that I have collected while beach combing the beautiful beaches of Oahu. Photos do not do the details in exquisite piece justice! I have a video of it so that you can see it from different angles. If you would like to see it please message me. The Headdress above has been sold. You will get a replica of this piece. You have the option to customize it as well! Please allow 4-12 weeks for creation, depending on my current workload. If you would like it sooner, please contact me to see time availability.